I definitely prefer wearing my hair straight and blonde over wearing a huge, dark brown afro … It’s simply more flattering. Not a political or cultural statement. Simply a preference. Q: Playing devil’s advocate here- if this statement is not meant to be political or cultural- why vocalize it on Facebook in the first place? Just curious. A: I recently unfriended an acquaintance on Facebook who had the nerve to tell me how he thought I should wear my hair and his preference for a more “natural” looking woman. Never mind the fact that I am romantically committed to someone. Never mind that my hair is personal and none of his business. This man felt so deeply offended by what he saw as a deeply political act that he was compelled to send me a message voicing his disappointment. Thus, the status update explaining that fashion, at least in this instance, is a matter of stylistic preference, and not a defense or critique of the how’s and why’s of what other women of African descent choose to do their hair. As you know —-, I’m a fan of the huge, dark brown afro … but, you already know, I love huge, curly hair. That being said, I agree with you that how you chose to wear your hair is your decision and a casual acquaintance has a lot of nerve to tell you what HE prefers. I don’t care what YOU prefer. I myself wear my hair curly, but on occasion wear it pressed. If someone who I knew peripherally, after seeing my hair pressed, had the nerve to tell me he preferred my hair straight, I’d be pissed. And, it would have nothing to do with how I view myself, but with that person’s belief that they have a right to tell me what they think of how I wear MY hair [as if] their opinion should matter to me when I know them not. At the end day, I found my friend’s statement to be about the presumption of male privilege rather than issues with self-image and acceptance. And, let me clarify, my friend loves her hair in every form and has rocked it in a variety of styles in its natural state. However, she has indicated that she currently prefers it blonde and straight. So, what do you think? Is this about preference, male privilege or racial politics? Can a Black woman’s preference for “straight and blonde” hair simply be an aesthetic choice and not fueled by a deeper, hidden meaning or self-hatred? Did the explanation that prompted the statement change your initial, visceral reaction to it? Everyone has a choice as to what they like for themselves. 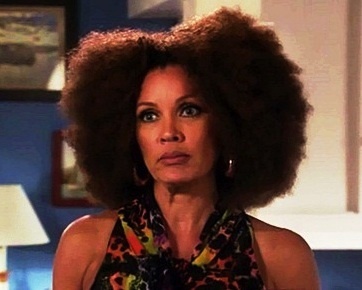 I advocate people giving up the perm/relaxer so that they have more choices. I gave up getting relaxers because I wanted to explore with color more. I could not imagine going blond while at the same time getting a relaxer. To me that was just to much for my hair in my opinion. To me hair is an accessory. How I choose to wear my hair is my business and only person who remotely has a say in what I decide is my husband. If he prefers one style over another I will consider it but at the end of the day it is what I like to see myself in. Everyone is not meant to wear big curly hair. I actually tell people that. It really is not for everybody. Plus I am a bit selfish I like to be the only one in the room with the big curly hair. I do not want anyone else to look like me. I honestly don’t have a problem with people getting relaxers. It’s a personal choice. As you know being natural, while we do have choices, it can be a lot more time consuming caring for our hair (finger detangling for ex.) and some people don’t want to deal with that. That’s their choice. Also, I don’t mind if a person tells me they like my hair straight or curly. Doesn’t bother me at all because they obviously have a preference and are expressing it. As long as it’s respectful, who cares? Honestly, I think this particular instance that you referenced probably has something to do with male privilege. The bottom line is though, not one person should be able to dictate what someone else does with their own body/hair (isn’t that a political statement). That being said…it is largely a politicial/cultural statement whether that person wants it to be or not. I say this because in all ways in which you present yourself to the world, you are projecting an image and that image carries with it assumptions about your heritage, class status and gender. That’s just the reality of the world. I personally believe everyone should do what the want, but in reality you just have to be prepared for people to have issues about your choices…that’s just how it is. I wasn’t quite sure how I felt when I first read this yesterday until later that evening when something similar happened to me. This new guy I met saw some old pictures of me with my long straight hair and he had the nerve to say “I don’t like that you cut your hair but I love your eyes” then “don’t cut your hair anymore” then he asked why I cut it so short (through a series of texts). I was pissed more than anything like the woman this article is about that he had the nerve to say those things to me and we barely even know each other. So I believe this is about male privilege, no politics or anything. I don’t wear my hair like this to make a political statement or for a cultural reason and when I did get it pressed that was b/c that was just what my grandmother had always done to it. Nothing more nothing less.